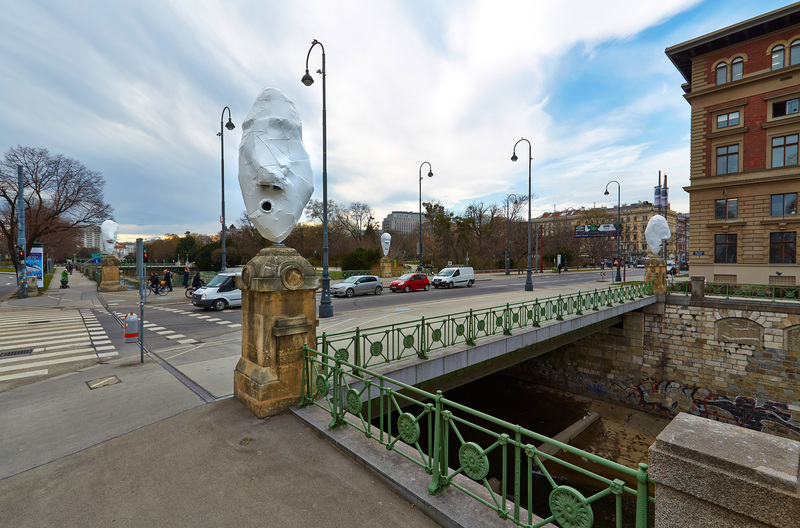 After an extensive restoration with the support of the lender and the Franz West Privatstiftung as well as the MAK ART SOCIETY (MARS), the 4 Larvae (Lemur Heads) (2001) by Franz West (1947–2012) return to the Stubenbrücke in Vienna today, 28 January 2016. On the occasion of the MAK retrospective Franz West: Merciless in 2001, the 4 Larvae (Lemur Heads) were displayed on the pylons of the Stubenbrücke, which connects Weiskirchnerstraße and Landstraßer Hauptstraße in the city center. Originally only intended to be shown during the exhibition, they were made available to the MAK on permanent loan and continued to be displayed on the bridge until they were removed in late 2014 for restoration work. “We are delighted that the lender has decided to continue to make the 4 Larvae (Lemur Heads) available to the MAK on loan and that these impressive outdoor sculptures can once again be experienced in public,” says Christoph Thun-Hohenstein, director of the MAK. sculpture and the body to interact. His environments translated the concept of the Passstücke into an extended spatial dimension and a multilayered social spectrum. In 2011 West was awarded the Golden Lion at the 54th Venice Biennale for his life’s work. The seemingly ancient 4 Larvae (Lemur Heads) made of painted, sculpted aluminum, which extend up to three meters in height, invite viewers to engage in a dialogue with the sculptural objects and combine with the symbolism of the inherently flowing water of the River Wien, whose loose, flexible, and unpredictable form leads to associations with chaos as a creative flow and a primeval material. In 2007 Franz West attached a plaque with a quotation from classical antiquity to one of the piers of the bridge: “Ever-newer waters flow on those who step into the same rivers, and (ever-new er) souls step out of the water,” (afterHeraclitus, fragment 12). At the same time, the lemurs, which are bathed in a blue light at night, serve as guards and monuments. As the artist intended, the sculptures trigger free associations in the context of the city and its history. The MAK has exhibited in public in Vienna for many years. Since 2004, James Turrell’s light installation MAKlite, which pulses an intense, multicolored light in the windows of the MAK, has counteracted the static appearance of the brick facade. Philip Johnson’s Wiener Trio, which was conceived for the exhibition Turning Point (1996), is displayed at the intersection of Franz-Josefs-Kai and Schottenring. Since 1996, Donald Judd’s Stage Set, which was also created for an exhibition at the MAK, has been on view in the Stadtpark next to the museum. In the park at the MAK Branch Geymüllerschlössel, visitors can see James Turrell’s skyspace The Other Horizon (1998/2004), among other works, which was developed for an exhibition at the MAK in 1998.